RARE AND EARLY FORM OF ALZHEIMER'S DISEASE : HYPERCONNECT NEURONS TO COMPENSATE FOR THE LOSS ? In a rare and early form of Alzheimer’s disease, ICM researchers have shown that, surprisingly, connectivity between neurons increases during the initial phase of the disease. This transitional increase would correspond to a mechanism set up by the brain to compensate for neuron loss. This study gives new therapeutic prospects for patients with neurodegenerative diseases, these hyper-connected networks could indeed become the target of future treatments. A rare and early form of Alzheimer’s Disease, called Posterior Cortical Atrophy (ACP) is due to deterioration of a brain area responsible for visual information processing. Patients do not suffer from memory disorders, but may present blurred vision, difficulties to read, write, recognise faces, orient themselves in space, grasp an object… The affected area corresponds to the posterior part of the cortex, which is located at the rear of the brain, and neuron degeneration is caused by senile plaque formation, such as in Alzheimer’s disease. Ventral stream is used to recognise a written letter, a face or an object, it is the ” what” way: what is what I see? The dorsal stream is used for locating objects in space, it is the “where ” way: where is the pen located in relation to my arm and what movement do-I have to make to reach it? In patients with ACP, these two pathways are “altered” on both structural (degeneration of neurons) and clinical (symptoms) plans. 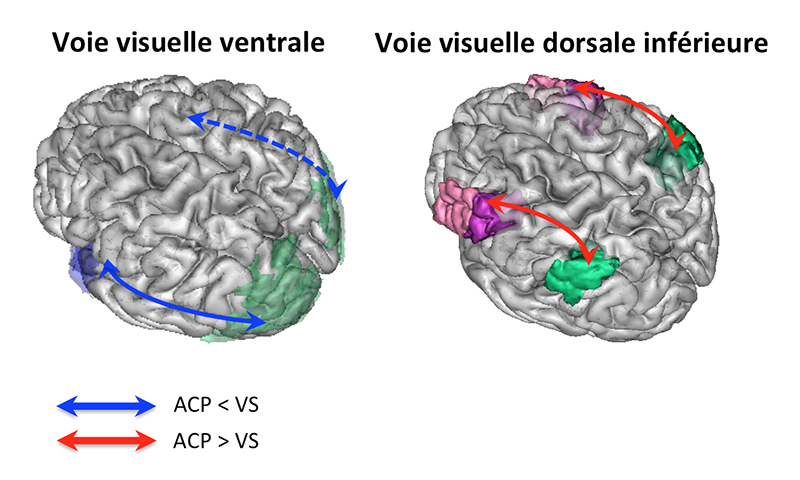 Through complex analyses of functional imaging, Raffaella Migliaccio from Bruno Dubois and Richard Levy’s team in collaboration with Paolo Bartolomeo’s team, and Cécile Gallea from Marie Vidailhet and Stéphane Lehéricy’s team have studied these visual pathways on the level of their functional connectivity. Since the posterior part is atrophied, and has therefore suffered from a loss of neurons, researchers expected to observe a decrease of functional connectivity. This is actually what is observed on the level of the ventral network, but, surprisingly, the dorsal network shows an increase of this functional connectivity. Results of functional connectivity in visual pathways of patients with posterior cortical atrophy (ACP) compared to healthy volunteers (VS). Thus, in a brain affected by the atrophy of a specific area, there is first an impairment of the structure, and surprisingly, this impairment leads to an increase in functional connectivity with some other areas. It is as if the affected area was trying to compensate for the loss of neurons by hyperconnecting those remaining. This compensation effort occuring in already very symptomatic patients corresponds to the initial phase of the disease, and thus could be transitional. Interpretation of these results is not unequivocal. This functional connectivity increase may indicate either an aberrant communication in the dorsal network in response to posterior atrophy, or a ” neuronal resilience” process set up by patients’ brain during the initial phase of the disease in order to better respond to brain damage through adaptative strategies. This study offers new therapeutic prospects for patients with neurodegenerative diseases. These hyper-connected networks could become a target for future treatments trying to stimulate, re-educate, or boost them, through cognitive rehabilitation, deep brain stimulation or transcranial stimulation . Reference: Functional Connectivity of Ventral and Dorsal Visual Streams in Posterior Cortical Atrophy. GUEST RESEARCHER : JONATHAN KIPNIS, "AN IMMUNE SYSTEM SPECIFIC TO THE BRAIN"
INVITED RESEARCHER: EMANUELE BURATTI, "TDP-43 PROTEIN IN NEURODEGENERATIVE DISEASES"